A Wednesday evening series of yacht races throughout the season split into 3 X 9 race series, Spring, Summer and Autumn. Races dual scored under IRC and NHC. A yacht racing event for a wide range of racing and cruising boats with classes for fast and slower boats. 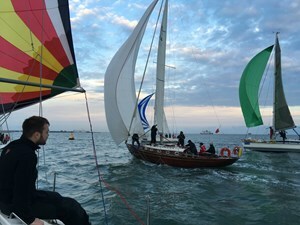 The Series is raced in the Eastern Solent with a start line at Gilkicker Point. The format is short races of approximately 1 hours duration with a start time of 1830. Clubhouse facilities including drinks and food available on completion of racing at Hornet Services Sailing Club. All Eastern Solent based yachts are welcome to participate. Details and documentation at the links below.